Like Flanders and the other Belgian classics, the main feature of the race is the cobblestones (or pavé, if you want to get all Francophile about it). Paris-Roubaix, however, doesn’t feature the cobbled bergs of Belgium, and instead asks its riders to cross flatter, rougher, and, all in all, tougher sections of pavé. Each one is given a 1 to 5 star rating, reflecting their difficulty. The most famous and feared are the Trouée d’Arenberg (the first 5 star section of the race), Mons-en-Pévèle, and Le Carrefour de l’Arbre – all three to feature in this year’s edition. This year there are 27 sectors of pavé, which means that, out of the total 257.5km, 52.7km will be on the pavé — about a fifth of a long day in the saddle. The first section comes after 98.5kms of racing, and the remaining 26 sections follow with only brief respites until the finish. Positioning coming into every sector is key for each team, as riders make sure they arrive first to pick their own lines over the rough terrain, reduce the chance of getting held up by mechanicals, and to try to dictate the pace over the stones. This excellent article from Rouleur last year takes a look at Koen De Kort’s power statistics from his Strava-tracked race. As a teammate of the eventual winner, John Degenkolb, it gives a great insight into just how hard every rider has to push themselves before, during, and after each pavé sector. The final section finishes with only 1.1km remaining, where it likely be a lone rider or small group that arrives at the Roubaix Velodrome for one of the most iconic finishes in sport. The final one and a half laps of the velodrome are not always victory laps, so keeping enough in reserve for a final sprint to the line is key — and if a rider has track experience, all the better! The prize is also iconic: a replica cobblestone on a plinth for the trophy and the winning rider’s name on a plaque in the Roubaix showers. Worth all the trouble? The riders seem to think so. One other factor that can completely change the race, more so than any other, is the weather. 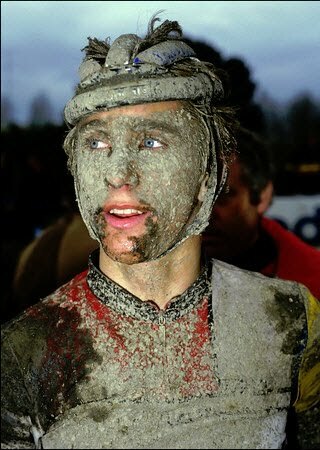 If it is wet, then Paris-Roubaix truly lives up to its hellish nickname. The cobbles become like ice, and the puddles that form on the sections of pavé obscure the danger that lurks beneath. 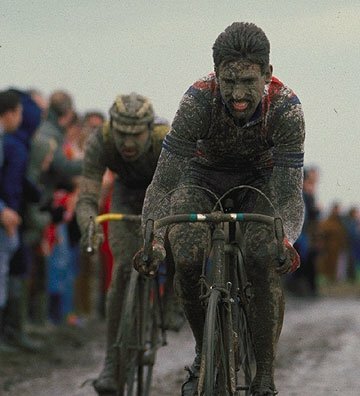 It also pleases the purists and harks back to the days of riders caked in mud — Sean Kelly and Greg Lemond in 1985 is a classic image. We haven’t had a wet race since 2002, but, if the forecast is to be believed, we could be in for some rain on Sunday. Most of the same riders who were in the mix in Flanders last week will feature here, but there are a few other candidates who might fancy their chances. Fabian Cancellara missed the key move last weekend when Peter Sagan, Sep Vanmarcke, and Michal Kwiatkowski went up the road. Although he managed to bridge to Vanmarcke, Sagan had already made his winning move on the Paeterberg. This is Fabian’s last monument, and his last chance to win a record fourth Paris-Roubaix. There is no question that he has the legs, form, team support, and skill to win Roubaix. We don’t think he can win from a lone time trial-style attack from 20/10km out — although his TT this year has been great — but if he is in the final group coming in to the Velodrome then he will be hard to out-sprint. Peter Sagan, the world champion, is finally on a roll this year, taking Gent-Wevelgem and the Tour of Flanders in the last two weeks. On paper, this race is not as suited to Sagan’s style: there are no sharp climbs to pull away on and drop his rivals, and there are better time trial attackers than him in the race. Again, his team support is quite poor, but then that never seems to hamper him. So, as ever, we can never fully write off Sagan. Even though he has only finished in the top ten once in this race (sixth, in 2013), he is the bookies’ favourite, and is certainly going to be a marked man on Sunday. One team who are investing plenty in this race is Etixx-QuickStep. Just look at that squad, featuring: Tom Boonen, Tony Martin, Nikki Terpstra and Zdeněk Štybar. However, their problem might be knowing who to rally around, as it looks like half their team could realistically be riding as leader. The fact that Boonen is not living up to his past form is the big reason why they haven’t been pulling off results recently. That said, Nikki Terpstra won here two years ago and could easily do so again. A lot has been written and spoken about Tony Martin targeting Roubaix (like his old time trial rival Bradley Wiggins tried last year). His performance on the cobbled stage of the Tour de France last year showed that he can ride well on the rough stuff and win, but the racing dynamic will be hugely different here. Štybar is maybe their best shot. He’s got a great sprint on him at the end of these long, sapping days, and he was, after all, second here last year. radars of the other favourites during the race. Jean-Pierre Drucker is another strong classics rider with a decent sprint, and will be a useful rider to have in the squad. Lars Boom loves a difficult, rainy, and muddy day of racing, so he should be in his element. He won the cobbled stage of the Tour de France in 2013 in those conditions, but he might not be in the same class as the other favourites on Sunday. Still, you can bet he won’t be too far from the head of affairs towards the end of the race, and he’ll almost certainly be amongst the opportunistic late attackers in the final sections of pavé. With Ian Stannard and Luke Rowe on their squad, this is Sky’s best chance at a monument win. They have a very strong team again, as they did in Flanders, and the Stannard-Rowe combo in joint leadership is ideal for Paris-Roubaix. Although Stannard skipped the early cobbled races to target this race, Rowe might actually be the stronger rider of the pair at the moment. He’s been constantly attacking when racing this year, and bagged an impressive fifth in Flanders last week. Jurgen Roelandts and Tiesj Benoot lead Lotto’s squad. Another rider who hit the tarmac and had a ‘DNF’ against his name in Flanders, Benoot is nevertheless signed up to race on Sunday — he also tried to start the Scheldeprijs midweek this week, but his team said no. We’re therefore uncertain of the toll his injuries have taken, and any pre-existing aches and pains will become a nightmare on the unforgiving cobbles. For this reason, we don’t think he will be in the final mix. Jurgen Roelandts is another hard attacking Belgium, and will likely lead the team. However, his best result here to date was 14th back in 2010, and the flat pavé sections aren’t as suited to him as the bergs of Belgium. It’s worth remembering that he came third, in messy circumstances, in the recent Milan-Sanremo though. Sep Vanmarcke took second place at Flanders last week, and second place here three years ago; could this be Vanmarcke’s lucky year? His form and experience suggest he is likely to feature in the key moves, and if he follows Fabian’s wheel like he did in 2013, there’s no reason we couldn’t see a re-run of that tele velodrome showdown. Let’s hope he’s upped his sprinting game. Edvald Boasson Hagen is Dimension Data’s best shot at a big result, and he’s repeatedly said that this is the one race he’d love to win. We can’t see that Mark Cavendish will be doing much other than riding in support for EBH here. Since the move from Team Sky, he’s grown ever more confident and is ever-present in race finales, so we’d be surprised not to see him feature in some way. Expect him to once again stick like glue to Cancellara’s wheel, unless he decides that fortune is favouring Sagan, instead. Alexander Kristoff is the other strong Norwegian in the field, and he’s got a good chance of using his immense power to get away with a small group before stealing a sprint victory in the velodrome. With no climbs to derail him, we think he should be able to stay amongst the leaders on the cobbles, which puts him within a good shot of the podium. At any rate, he’ll be in the top ten. For outsiders, look to: Johan Le Bon, Sylvain Chavanel, Dylan Van Baarle, Roy Jans, Heinrich Haussler and Jens Keukeleire. Andy is choosing Luke Rowe. Eighth place last year, fifth place last week, first place tomorrow. Or so he hopes. Rowe should get the go-ahead from Sky to ride his own race in the final 50km, in which case he’s got a great chance of getting a high podium finish. James has gone for Sep Vanmarcke. He’s showing great form at the moment, like in the Tour of Flanders, and he’ll be targeting this one with the full support of his team to go one better than his 2013 result. Chris will play the favourites game and go with Fabian Cancellara. It’s really hard to look past the Swiss, who has consistently performed well in the spring classics this year, has always gone hard at Roubaix (and has several wins to his name), and he’s got it all to ride for in his final year.